Interactive dashboards, which display real-time enterprise compliance metrics for up-to-date situational awareness of network risk. Vital reports with details on privileged users, Web PKI and DMZ, asset inventory, system authorization, HBSS/ESS Services, patching and overall organization software compliance. 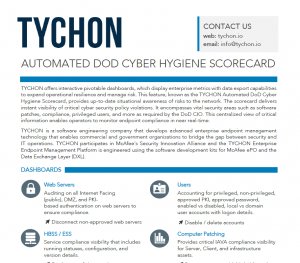 The TYCHON Automated DoD Cyber Hygiene Scorecard feature is made up of eight individual dashboards, each with their own configurable statistics.